Eugalta cameroni, from Kyohei Watanabe. The Neoxoridini are a group of ichneumon wasps parasitic on wood-boring beetle larvae. Characters (from Wahl & Gauld 1998, as Poemeniini): Apical margin of clypeus without median tubercle; clypeus small and subrectangular, or large and convex; gena denticulate; mesoscutum without transverse rugae; epicnemial carina absent; metapleuron usually swollen; propodeum elongate, spiracle at or beyond midpoint; hind coxa elongate, length ≥ 2.3 × width (latter measured just past basal constriction); T1 usually without distinct lateral longitudinal carina; T1 and S1 fused; T2 without grooves. [IK05] Idris, A. B., & L. Khairiza. 2005. A catalogue of Neoxoridini and Rhyssini (Ichneumonidae: Pimplinae) from Malaysia. Serangga 10 (1-2): 93-110. Wahl, D. B., & I. D. Gauld. 1998. 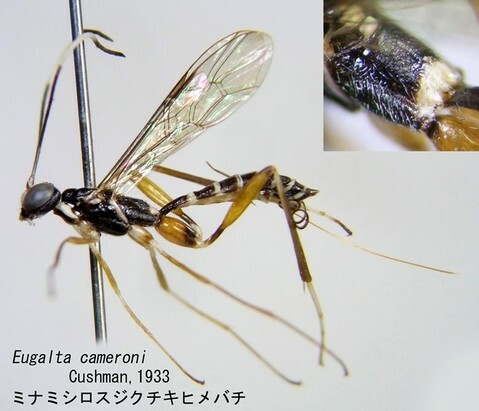 The cladistics and higher classification of the Pimpliformes (Hymenoptera: Ichneumonidae). Systematic Entomology 23: 265-298.